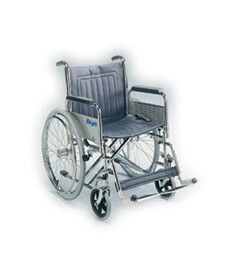 This steel self-propelled wheelchair comes with detachable armrests and detachable swing away footrests. This model comes with a fixed back, and is made from heavy gauge steel tubing with a double cross bar for extra strength. Version also available with Folding Back making the chair more compact for storage.